Can Earth Plants and Bacteria Grow On Mars? 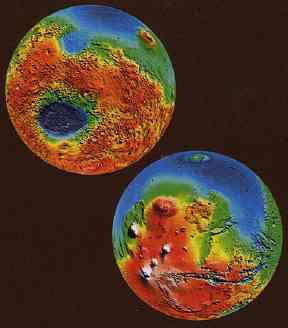 Global topographic map of Mars created from more than 6 million laser measurements by the Mars Orbiter Laser Altimeter (MOLA) instrument on the Mars Global Surveyor spacecraft. Red is highest altitude and blue is lowest. The Northern Hemisphere of Mars shown in the bottom globe is several meters lower than the Southern Hemisphere and is where water would have collected if it ever existed, shown in blue. The big groove is the Valles Marineris, largest canyon in solar system and the white objects are the huge volcanoes in the Tharsis Montes, Olympus Mons being the largest volcano in the solar system. Large blue oval on upper globe is the Hellas Basin, the largest crater impact known in the solar system. Images courtesy NASA. March 18, 2001 Houston, Texas - This past week I was in Houston at the Johnson Space Center to attend the 32nd Lunar and Planetary Space Institute meeting held since the first Apollo days. This was the largest conference so far. More than a thousand planetary scientists from around the world presented their latest research data on Mercury, Venus, Earth's Moon, the Asteroid Eros, Jupiter's moons, Europa, Callisto and Io. But probably the most exciting sessions were about Mars. There were more than a hundred papers presented about the red planet. Hundreds of high resolution photographs from the Mars Global Surveyor showed valleys and rippled features that on Earth would mean only one thing: water. Previous PostPrevious Are the “Tubes” On Mars from Lava, Water, or Wind?